Breakfast has always been my least favorite meal. 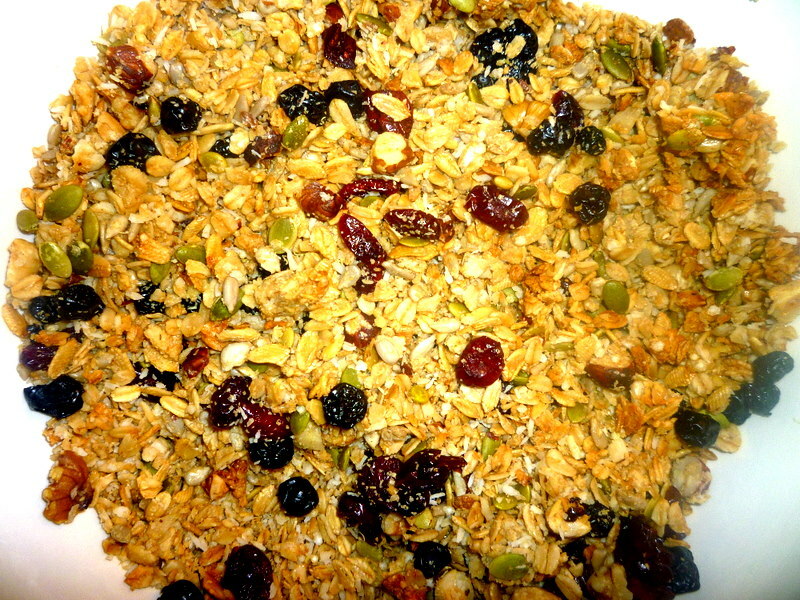 I was grateful when I found a love for Nature’s Path Fiber Flakes accompanied with my home-made granola, for it had been my go to for nearly 7 years, until it was replaced with the Dr. Oz’s morning shake. I would take a picture of this new beverage shake I have been making, however, my trashed camera, has only been more trashed when 2 and 3 decided to do photo shoot without my knowing, so…until I have a new camera, I will just share the recipe. I am not sure if I have become accustomed to the taste, or if I just really love it, but I know Sean is not a huge fan. Give it a try if you are uncertain of morning shakes, or are just looking for something new to add to your morning menu. This is a great shake as well after a workout or a run. All the best! Remember this? Do you remember this guy? I remember. I also remember searching our Kmart with my mom and grandma crying how badly I wanted a Wayne Gretzky Ken Doll. Did I find one? Yes I did, however, the box had been opened and his skates were missing. Did I care? Not one bit, because my Wayne Gretzky doll was not going to be ice skating. I came across this image of Pro Stars. Man oh man. 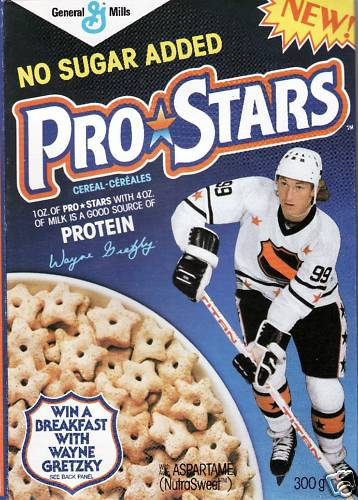 I used to eat my bowel of Pro Stars faithfully every morning in my awkward 10 year old body. I would eat and stare at the box. Wayne Gretzky. I don’t ever recall the Pro Stars my mom bought being sugar free. I can’t believe Aspartame was even in the 1980’s…eeks. Ever since we found out 2 has wheat, gluten, and dairy allergies, my breakfast table is not sporting any Pro Stars cereal or much of any of that which I would typically have eaten at 4 years old. I think at his age I was eating Sugar Crisp and Captain Crunch…I know, shocking, but let’s just say once I turned 11 my whole world of eating what I liked flipped upside down too when I was told I had mushrooms growing in my stomach. New to Germany, new to school, horrific acne, and stomach disorders, let’s just say having to go vegan was a shock not only to my body, but to my resort of comfort eating. I am aware that there are many others finding out their children are having allergies to the foods we consume, and it can be overwhelming. I find breakfast overwhelming. 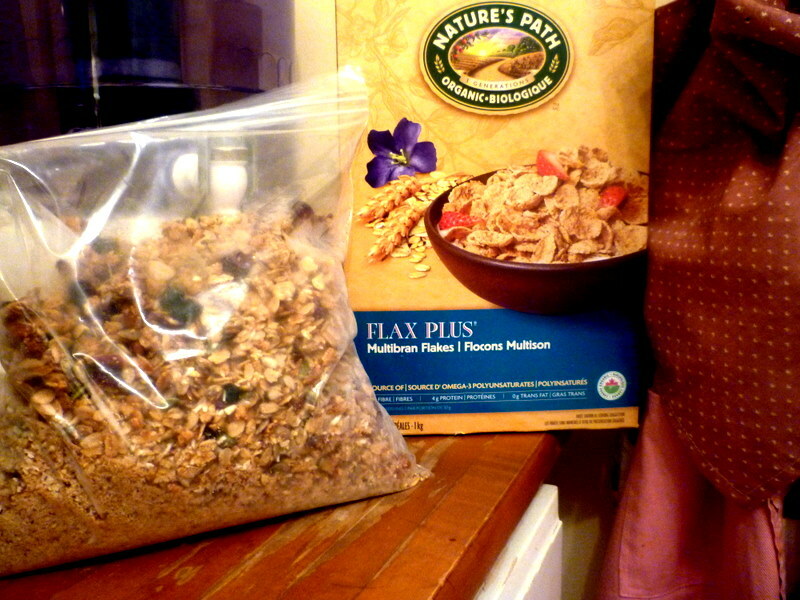 Before December of last year, I had eaten the same traditional breakfast every day for the last 7 years- Nature’s Path Flax Plus and homemade granola. In December, Sean and I did the Dr. Oz 3 day detox, and his breakfast shake has been my go to since. 2 went from eating 2 pieces of Silver Hills bread with Almond butter and a bowl of Cheerios to Silver Hills gluten free Chia seed bread with coconut oil, cinnamon and coconut sugar and a side bowl of gluten free Mesa Sunrise cereal with dried blueberries in Almond milk. It is working. 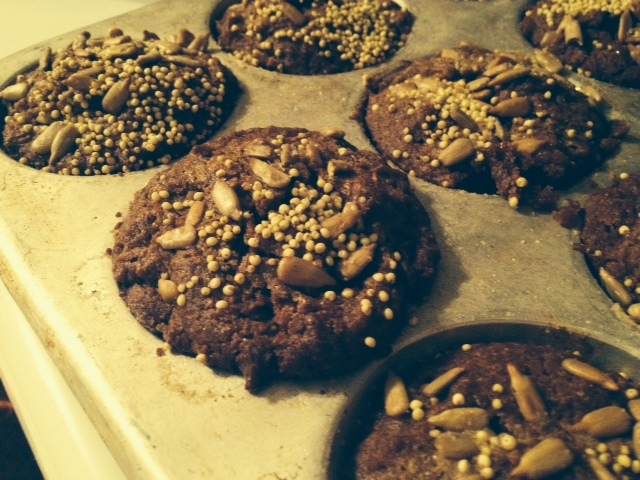 What also is working, are these Pumpkin Muffins. They are from Post Punk Kitchen with a couple of minor adjustments. 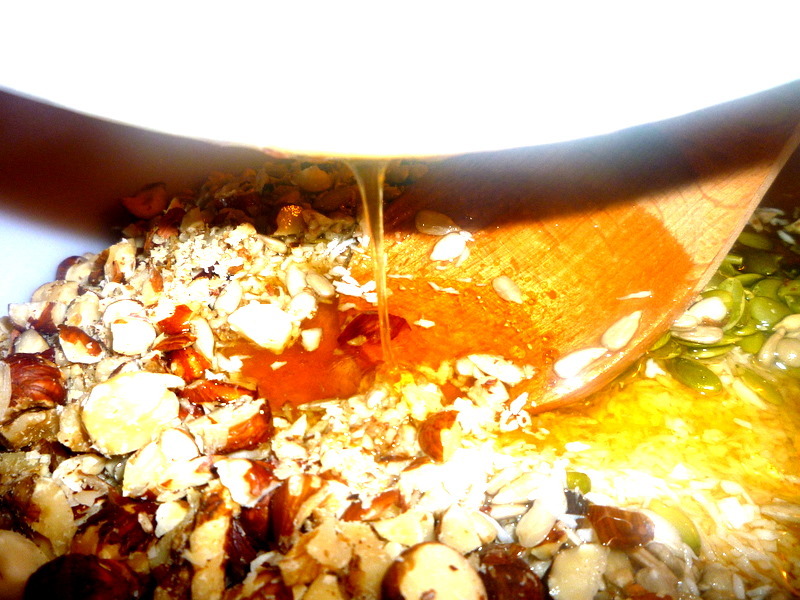 Variation: Fold in a cup of either chopped fresh cranberries or chopped walnuts, or a mixture of the two. Fill the muffin cups two-thirds full. 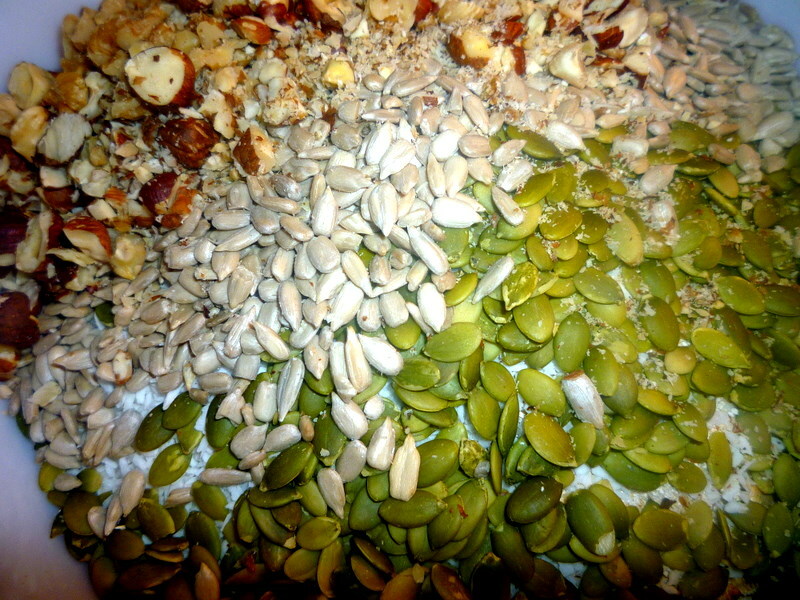 Sprinkle with pumpkin seeds, sunflower seeds, or millet, and a touch of sugar. 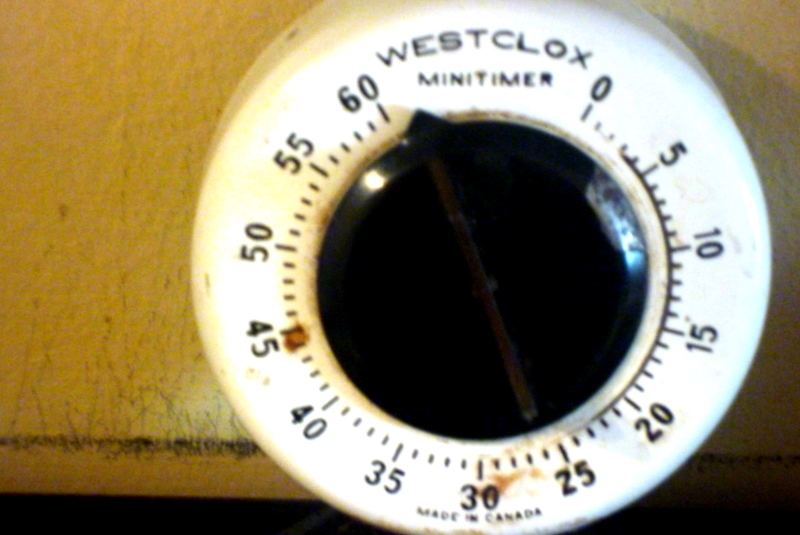 Bake for 18 to 20 minutes, until a toothpick or knife inserted in the center comes out clean. It is a family tradition, perhaps a prediction, that when the kids wake up and realize it’s Saturday, they scream PANCAKES! Though Sean and I are still sleeping and asking one another what time it is, as I’m trying to read the red numbers on the digital clock with blurred eyes and messed hair in my face. It is not surprising to see that it is 6:15am, because it is tradition. I used to make the pancakes faithfully for the kids, but when my pregnancy with 3 reached the point of super exhaustion, Sean took over. I actually think the kids like his pancakes better, because I would often lose track of time or day dream and then burn them. Not cool, I know. Today was a special Saturday. 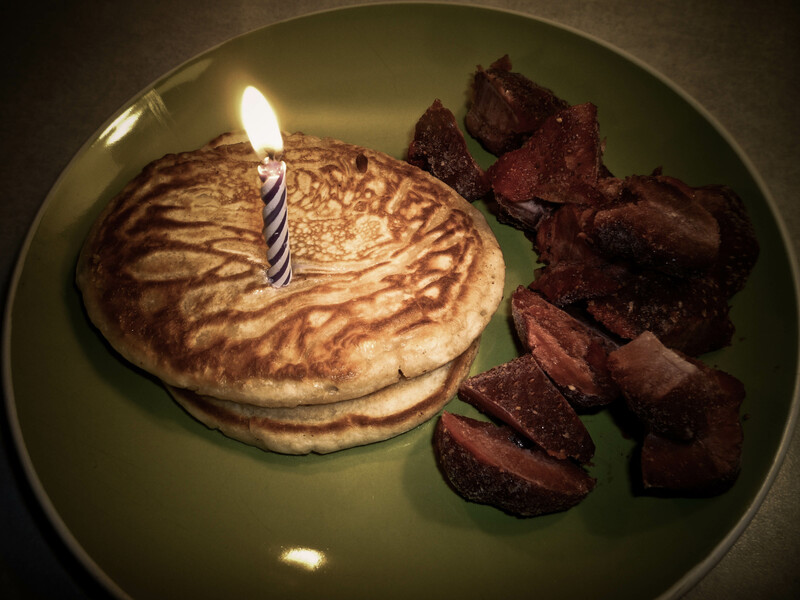 Not a typical one at all, because we celebrated 1’s fifth birthday today. As 2 says, “I want Panacakes daddy.” They love them and hopefully others will find them easy, tasty, and quick to make…just no daydreaming! Our kids love them with frozen strawberries, blueberries, or raspberries. In the summer months we use fresh fruit from the local berry farms. 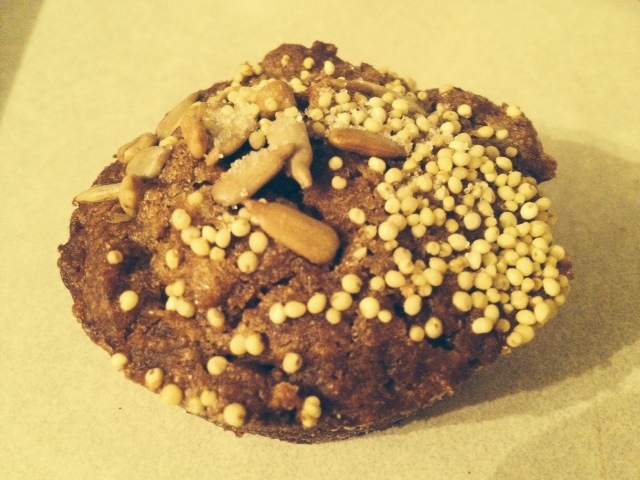 Today the kids and I baked banana nut with chocolate chips and chia seed muffins. 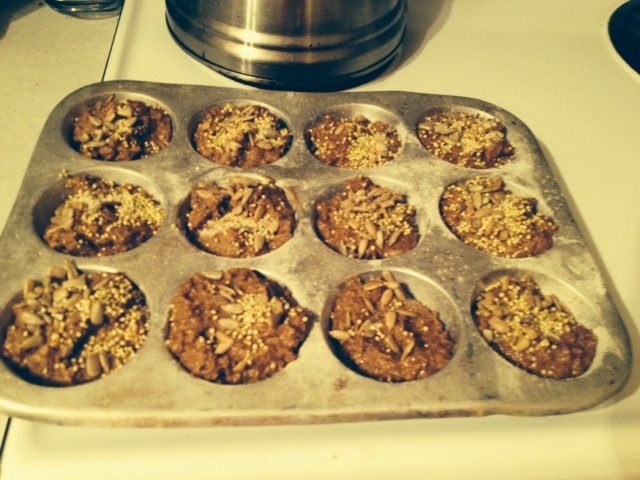 It is kind of a mouthful, but they turned out pretty good. 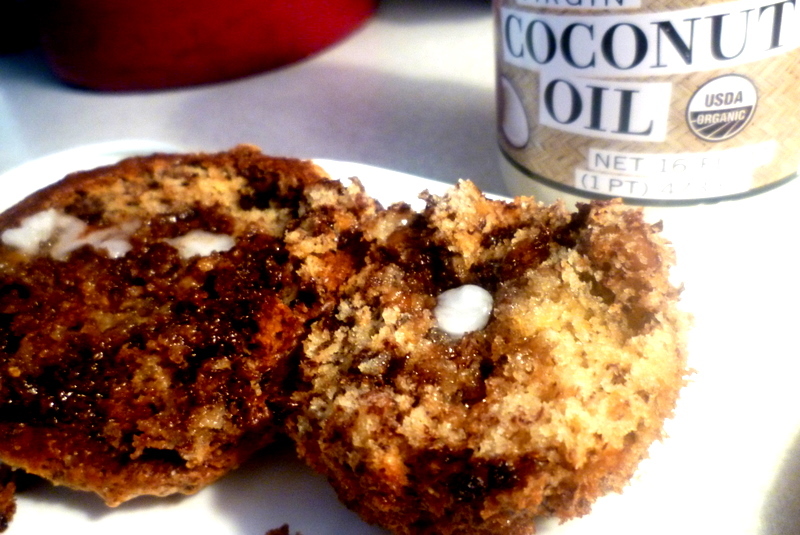 I personally like banana loaf a great deal more, but what matters to me most is that the kids had fun and coconut oil makes everything taste super. The muffins aren’t very healthy for they have white flour and white sugar, but they make for a nice quick snack on those days when you have no idea what to feed the ever starving children. Chia seeds are high in protein, lipids, fiber, and antioxidants. It is high in Omega-3, as well as gluten free. It is kind of superstar. It was my first time adding it to the banana loaf recipe, and the kids are wolfing it down and don’t seem to notice a taste difference. Thanks superstar chia seeds! Pre heat oven to 350 degrees. Butter and flour a 9×5 loaf pan. ( I typically use two loaf pans, however in this case, I used one, to make a small loaf, and made a dozen muffins with the extra batter). Combine the flour, wheat germ, baking powder, soda, and salt in a small bowl and set aside. In a large bowl, cream together the butter and sugars. Blend in the eggs one at a time until well incorporated. Mash together the bananas and sour cream. Add one-third of the flour mix into the creamed sugar/butter mix. Next, stir in the banana mash and mix thoroughly. Add the remainder of the flour and mix on low until well combined, taking care not to overmix. 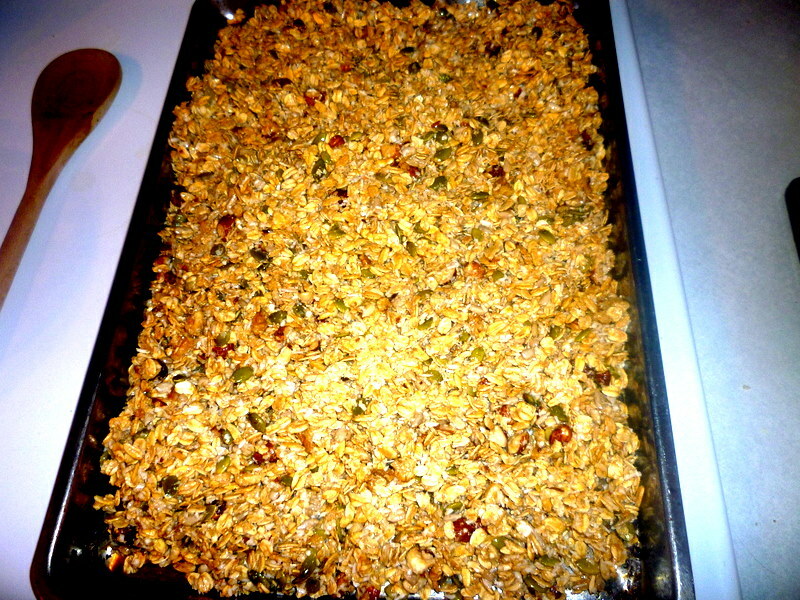 Gently fold in the walnuts, flax seeds, chia seeds, and chocolate chips. Pour batter into the prepared pan, smoothing the top, and sprinkling with white sugar, bake for 30-35 minutes, until inserted toothpick comes out clean. For the muffins, put in muffin tray and sprinkle with sugar and bake for roughly 28-30 minutes, until inserted toothpick comes out clean. When making solely a loaf, I would give it about an hour to cook all the way through. 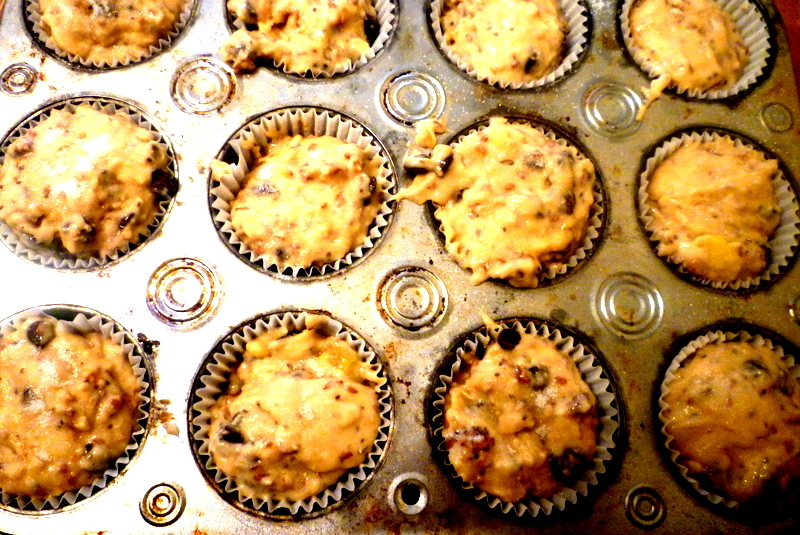 I tend to under-bake as opposed to over bake, for I like baked goods to not be too dry in texture. 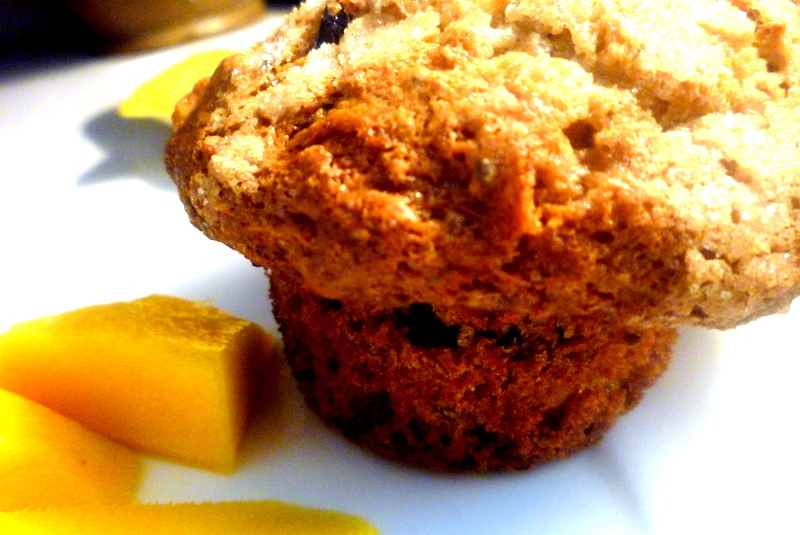 Let loaf and muffins cool for about 10 minutes before taking them out of the pans and serve with coconut oil…the ultimate best spread with healthy benefits such as: hair care, skin care, stress relief, maintaining cholesterol levels, weight loss, increased immunity, proper digestion and metabolism, relief from kidney problems, heart diseases, high blood pressure, cancer, dental care, and bone strength, just to name a few. Every morning I must have my favorite cereal. I have had it almost every morning for the last 6 years, which shocks me as I write this. Six years?! That is a long time, and sure there were days when I wasn’t in the comforts of my home, or in my typical routine, due to travelling, holidays, or having babies, but what surprises me most is that I am not tired of it, yet. Will I ever be? Who knows? As for now, I will just continue being content with Nature’s Path Flax Plus Flakes and my homemade granola, inspired by Rebar’s cranberry and hazelnut granola. 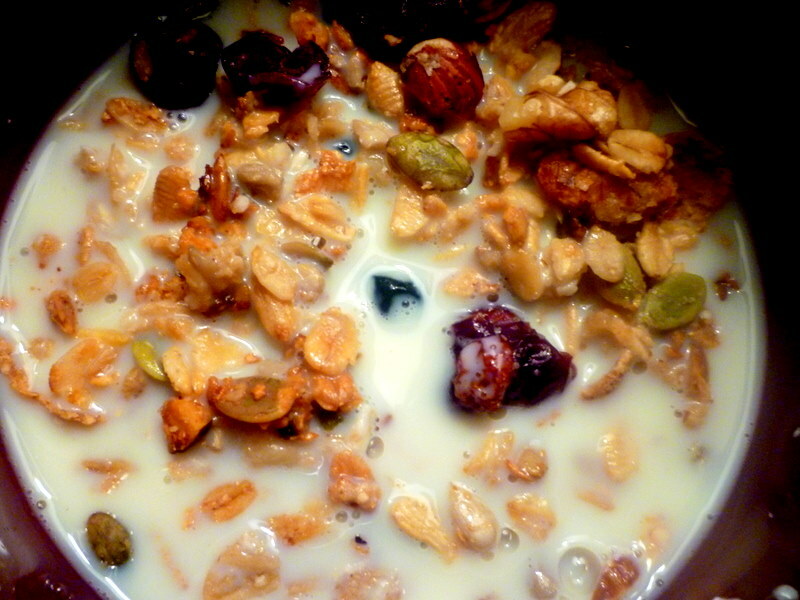 The super fun thing about granola is you can mix it up with whatever you like and add your must have’s, as well. My must have’s are walnuts. I love walnuts in this and pretty much in everything. In a large bowl, combine the first 9 ingredients. In a smaller bowl, combine the oil, water, honey, maple syrup, and vanilla and whisk together, until well combined. Add the wet and dry mixes together and stir thoroughly. Spread the mixture out onto two baking sheets (or do it in two batches). Bake at 250 for 20-30 minutes. Stir the mixture every 10 minutes to ensure even baking and remove from oven when golden brown. Cool and stir in the dried fruit. Seal and store for up to 1 month. I like to keep mine in the freezer.